Here at top-secret Juice headquarters, some major new products are in the works, and we want to promote them with Google’s revenue powerhouse (also known as Google AdWords). Thus, after three weeks of self-imposed AdWords boot camp, I have emerged with a few scrapes and burns, along with some tips that I wish I had been armed with since the beginning. The natural place to start learning about Google AdWords is the official Help Center, an expansive and neatly categorized resource. But what happens if your inhuman schedule or dwindling coffee supplies don’t allow you the luxury of navigating through the help center hierarchy or sifting through its search results? While you might be able to maintain a semblance of a campaign without answering those lingering questions, you run a high risk of letting potential viewers slip away, never seeing your ad, and wasting money on high CPCs (cost-per-click). You are hereby invited to learn from my mistakes. I am forgoing the usual basic topics in favor of questions whose answers are more time-consuming and tedious to find. It took me a few weeks to get comfortable with AdWords and figure out these answers myself, but it will only take you a few minutes! How creative should I be with my ad text? How do I find out what keywords my competitors are using? Why has Google’s heartless algorithm condemned my keyword as inactive? How do I get bolded words in my ad? What is dynamic keyword insertion, and how do I use it? What is the difference between a campaign and an ad group? What is the difference between keywords and placements? 1. How creative should I be with my ad text? The “Viva la Revolucion” ad was my baby. But it turned out to have a face only a mother could love, as evidenced by the zero people who clicked on it. To the stunned disappointment of my right brain, Google AdWords is just as algorithm-fueled as any of Google’s other products. In fact, Google AdWords runs much like the ubiquitous search engine does, treating your keywords, ads, and landing page similar to the way it treats the 1 trillion pages it crawls while looking for content. 2. How do I find out what keywords my competitors are using? 3. Why has Google’s heartless algorithm condemned my keyword as inactive? You dumped a lot of unrelated (or weakly related) keywords into one gigantic ad group. Try making many smaller ad groups, each with its own tightly-connected set of keywords. Ideally, every keyword in a given ad group is a synonym for all the other keywords in the ad group. This also helps tremendously with writing ads that use dynamic keyword insertion (see question #5), since forcing ads to accommodate keywords covering a wide range of topics and/or parts of speech makes the ads vague and unspecific. To find keywords that deserve synonym status, use Google Sets. It’s like a thesaurus on steroids. Your keyword, ads, and landing page aren’t “relevant” enough to each other. All members of the Holy Trinity of content (keywords, ads, and landing page) need to draw from the same words to be considered related. Try making sure that they line up. The cost per click you set for that keyword falls below the minimum. This is the nicer way of saying that you have to spend more money. 4. How do I get bolded words in my ad? 5. What is dynamic keyword insertion, and how do I use it? You can tweak the capitalization of the keyword with Google’s guidance, in the form of this handy table and more. 6. What is the difference between a campaign and an ad group? A campaign is made up of one or more ad groups. Each campaign has one budget (i.e., $10/day) that is shared between all of its ad groups. Each ad group can be customized with different ad variations, keywords, placements, days and times the ad is shown, etc. Therefore, most modifying and experimenting happens on the ad group level. 7. What is the difference between keywords and placements? Google’s Placement Tool allows you to browse a gigantic list of sites organized by topic. Any of these sites could have your ad on it. The Placement Tool will also suggest sites and break down your potential audience by demographic. Google will select sites in the content network based on information from your current campaign. These sites may make up the bulk of your impressions and clicks on the content network and in general (in other words, clicks from the Google’s selected placements may outnumber both clicks from your selected placements and clicks from organic searches). 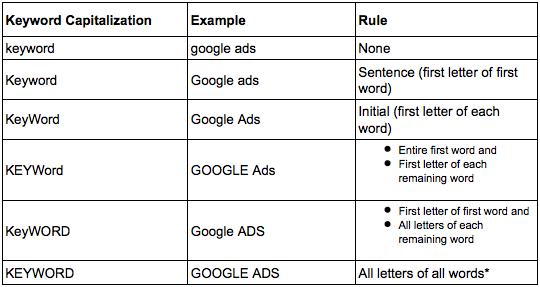 This list is by no means a comprehensive examination of AdWords, but at least now you can consider yourself three weeks wiser and three weeks closer to writing one that is.